Storefronts Seattle launched this Thursday with a ceremony at the Seattle Metropolitan Police Museum. The museum was crowded with artists, property owners and community representatives. Additionally, the visit of the Seattle Mayor Mike McGinn was a great honor for everyone involved in the Storefronts Seattle project. I had the chance to talk to some of the artists and was glad to see their excitement about their new spaces. 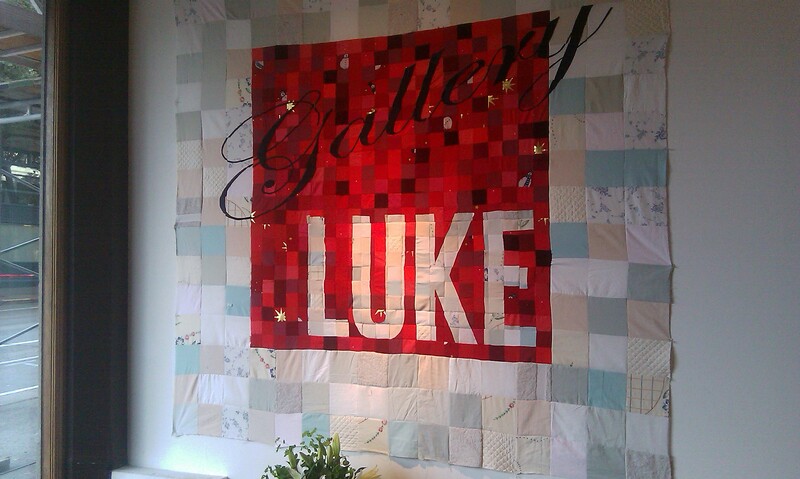 Quilt artist LUKE Haynes came to Seattle just a few months ago and, before the Storefronts Seattle opportunity, he was using his friend’s garage as his quilting studio. “I’m fired up,” he said about his new studio and retail space on 2nd Ave. His new gallery is a neat space with plenty of lighting and high ceilings: perfect to exhibit the large-scale quilting projects he likes to do. LUKE’s next-door neighbor, theater director Melanie St. Ours is using a former retailspace for rehearsals and workshops. She was about to close the space’s doors when I stepped in, but decided to leave it open for a few more minutes to engage with me as part of her community theater project. As she asked me questions and I was jotting down my answers, I noticed several sheets of papers with answers of other participants hanging from old shelf stands. The stands were a great fit for hanging notes, she said. I also stopped by Ingrid Lahti’s neon sign installation on 3rd Avenue in the Tashiro Kaplan Building. Ingrid was not there, but it was fun to watch people pass by and stop with curious gazes. 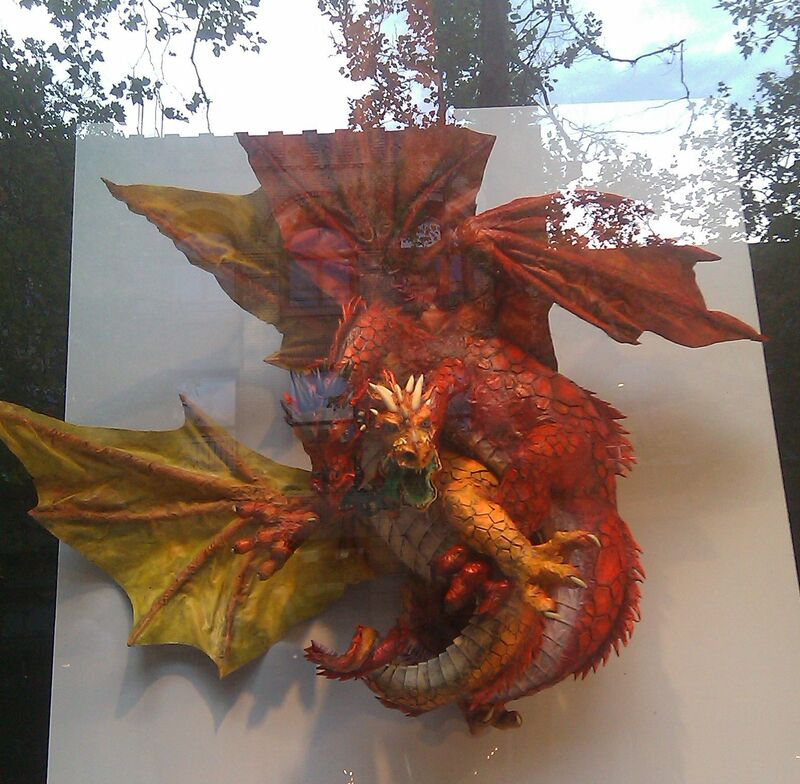 My last stop in Pioneer Square was 312 Occidental Ave, where Dan Reeder’s colorful paper mache dragons are displayed. There were so many people in front of Dan’s storefront, that it took me a while to find a space to take a few pictures of his dragons. Dan and his wife were observing the movement from a distance and came to talk to me when they saw me in the middle of the crowd. He told me he was happy with the lighting of his windows and was proud to show me the color details of each dragon. LUKE, Melanie, Ingrid and Dan are the Storefronts Seattle artists of Pioneer Square. Stay tuned to hear more on the creative people from the Chinatown-International District! Music and performing arts lover, music maker, music player. Seattle adoptive daughter. This entry was posted in Uncategorized and tagged Dan Reeder, Gallery LUKE, Ingrid Lahti, LUKE Haynes, Melanie St. Ours, Mike McGinn, Seattle Mayor, Seattle Metropolitan Police Museum. Bookmark the permalink.